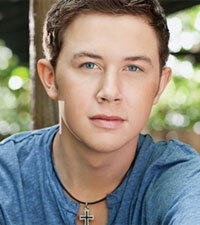 WISH SCOTTY MCCREERY HAPPY 18TH BIRTHDAY! 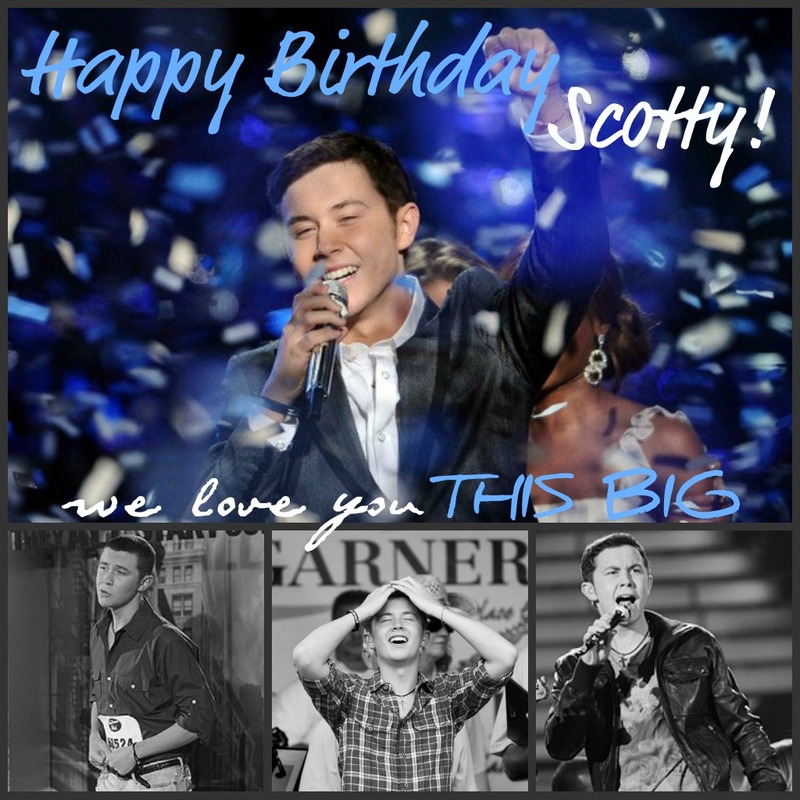 Wish Scotty McCreery a happy birthday! Scotty turns 18 on October 9th! In the comments section below, feel free to post your birthday wish for him as part of our virtual birthday card. Please help us get as many wishes as possible by spreading the word through e-mail, Twitter, Facebook and whatever else you can think of. Let's make Scotty's 18th birthday the best yet! THERE IS NOW A TAB AT THE TOP OF THE SITE TO LEAVE YOUR COMMENTS AND BIRTHDAY WISHES! YOU CAN LEAVE THEM EITHER HERE AT THIS POST, OR AT THE ABOVE TAB. THANK YOU !! REMEMBER SCOTTY WILL BE READING YOUR COMMENTS, SO PLEASE KEEP THEM APPROPRIATE - DON'T ASK IF HE'S DATING LAUREN :/ HAHA! It seems it will be something we can view, not join in on. I'm not really sure I understand if this is a person to person interview, or if Scotty will be typing his answers and not with the person, or on a phone call. lol - Either way it sounds exciting! Our live chat with Scotty begins Monday, Oct. 3 at 1:00 PM ET. You can watch here right on The Boot's homepage, or over on our Facebook page (www.facebook.com/thebootcountry). We'll be taking questions live via Facebook, or you can pre-submit questions here. Just let us know your first name and what town you live in, so Scotty knows whose question he's answering and can address you personally! Mark your calendars: this Monday, Oct. 3 at 1:00 PM ET, watch a live chat with Scotty McCreery here or here. NASHVILLE, TENN (September 28, 2011) – “Hearing Ryan Seacrest say your name, I don’t know if there’s a word to describe that feeling,” says “American Idol” winner Scotty McCreery in Introducing: Scotty McCreery. “ It’s definitely a big change going from a normal teenager to the biggest show on television.” Premiering Monday,October 3, 9:00 p.m./Eastern on Great American Country (GAC), the special features interviews with those closest to country music’s rising star: his parents, high school music teacher, baseball coach, guitar teacher and church choir conductor and includes never-before-seen-photographs and video footage from throughout his childhood in Garner, North Carolina. In the summer of 2010 and with his parents’ support, McCreery went to Milwaukee for an “American Idol” cattle call audition. “I remember vividly walking around the Bradley Center and Scotty looked at me and said, ‘Dad, I’m so in over my head,’” said Mike McCreery. “I looked at him and just said, ‘Do your best and we’ll see what happens,’ and that’s how it all began.” As McCreery continued to move through the competition, his entire hometown was behind him, staging city-wide viewing parties. “I always believed in myself and knew that I could sing, but it’s cool to see Americans respond to you,” McCreery said. Introducing: Scotty McCreery premieres the night before his debut album – Clear As Day – is released October 4. Scotty McCreery - Brad Paisleys Level of Success? FROM: NY Daily News, While there isn't anything new or earth shattering in this article I just wanted to post it to highlight a few great lines. I am so excited for Scotty to tour with Brad! An I agree, I think he'll have the same level of success, don't you?! Brad Paisley/TwitterBrad Paisley tweeted a picture of himself with Scotty McCreery after the announcement. "American Idol" winner Scotty McCreery's burgeoning career just got a major boost. Country superstar Brad Paisley has invited the teen to go on tour with him in 2012. The announcement comes just a week before the release of McCreery's debut album, "Clear As Day." And Paisely didn't deliver the big news via a press release, website or even Twitter. He surprised his audience during the final stop on his H2O II tour by bringing McCreery onstage. "Do you want to go on tour with me?" Paisley asked the American Idol -- who enthusiastically nodded yes. "Great, I'm going to take you out next year!" 'AMERICAN IDOL' ALUMS -- WHERE ARE THEY NOW? After he stepped offstage. McCreery could hardly contain his excitement about touring with Paisely, who has released 16 singles which shot all the way to No. 1 on the country charts. "It's really humbling that someone like him would invite me to tour w/ him," tweeted the 17-year-old North Carolina native. "I just hope I'm ready for any pranks he throws my way." McCreery is well on his way to reaching Paisely's level of success. His debut single, "I Love You This Big," made it to No. 15 on the U.S. Country chart.